CORAL GABLES, Fla. -- The man who shot and killed two managers at a Florida gym before turning the gun on himself had just been fired from the fitness center for workplace violence, police said Sunday. The Miami-Dade Police Department said in a statement that 33-year-old Abeku Wilson of Miami was let go Saturday as a fitness trainer at the Equinox gym in Coral Gables “due to workplace violence and was escorted off the premises.” Authorities didn’t elaborate on what that violence involved. Shortly after his dismissal, Wilson returned to the gym with a handgun and fired multiple shots at both managers before fatally shooting himself. Witnesses at the gym said he seemed to know exactly where he was going, CBS Miami reports. Police said the managers were deliberately targeted and that the shooting wasn’t random. 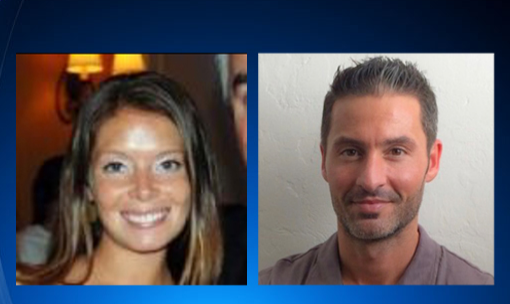 Equinox said in an email statement that it was “deeply saddened” by the deaths of the two employees, 35-year-old Janine Ackerman of Miami and 42-year-old Marios Hortis of Miami Beach. Ackerman was the gym’s general manager and Hortis the fitness manager. “Our love, prayers and condolences are with both families during this terrible time. The collective Equinox community will always keep Janine and Marios in our hearts,” the statement said. Marc Sarnoff, who previously trained with Wilson for two years, saw him at the gym before Saturday’s shooting and noticed something was wrong. Wilson typically was “very buttoned up, very proper, very appropriate,” Sarnoff said in a phone interview. But on Saturday, Wilson physically bumped into Sarnoff and his current trainer. The usually adept Wilson seemed noticeably off-kilter. The shooting happened about 1 p.m. Saturday at the upscale Shops at Merrick Park, which is a few miles from the University of Miami campus. Shoppers, diners at mall restaurants and people in workout gear ran to safety or took cover after reports of gunfire. The commotion got the attention of a Coral Gables officer, who ran into the gym, CBS Miami reports. Sources said Wilson saw the officer, ran into a bathroom and shot himself. Management at The Shops at Merrick Park activated their alert system and the mall was evacuated. Some were sheltered inside stores and the entire mall was shut down for hours. Wilson trained Eveliny Bastos-Klein shortly before Saturday’s shooting. She told The Miami Herald that he didn’t seem distracted and that she didn’t notice anything unusual during their session. An Instagram account in his name is filled with shirtless, muscly photos talking about body building competitions that he was preparing for. In December, a posting said he had gotten a blue belt in martial arts. “She was smart, she was athletic, she was charming, she was determined,” he said in a phone interview. He said she was a hard worker who shined at everything she set her mind to. The New Jersey native was once chosen out of more than 1,000 students as the student leader for the prestigious South Beach Wine & Food Festival and later went to work at the Fontainebleau hotel, he added. She’d been promoted to general manager of the upscale gym in August. “My initial reaction was, ‘No, this can’t be. Why would anybody want to hurt such a lovely person’,” he said. Friends and colleagues described Hortis as a beloved spinning instructor with a generous spirit and warm demeanor. A photo of Hortis clad in black workout clothes, sitting on a bike while leading a class circulated online.